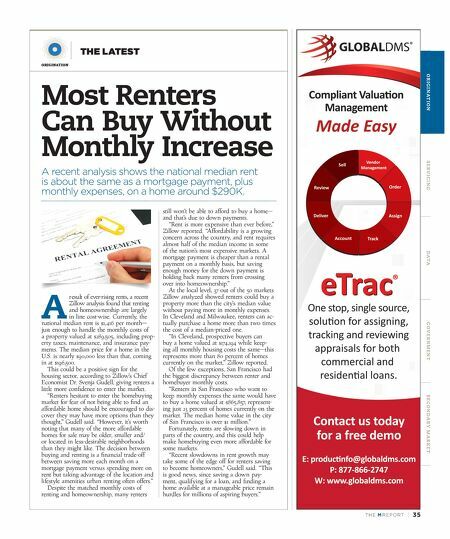 TH E M R EP O RT | 35 O R I G I NAT I O N S E R V I C I N G DATA G O V E R N M E N T S E C O N DA R Y M A R K E T ORIGINATION THE LATEST Most Renters Can Buy Without Monthly Increase A recent analysis shows the national median rent is about the same as a mortgage payment, plus monthly expenses, on a home around $290K. A result of ever-rising rents, a recent Zillow analysis found that renting and homeownership are largely in line cost-wise. Currently, the national median rent is $1,416 per month— just enough to handle the monthly costs of a property valued at $289,505, including prop - erty taxes, maintenance, and insurance pay- ments. The median price for a home in the U.S. is nearly $90,000 less than that, coming in at $196,500. This could be a positive sign for the housing sector, according to Zillow's Chief Economist Dr. Svenja Gudell, giving renters a little more confidence to enter the market. "Renters hesitant to enter the homebuying market for fear of not being able to find an affordable home should be encouraged to dis - cover they may have more options than they thought," Gudell said. "However, it's worth noting that many of the more affordable homes for sale may be older, smaller and/ or located in less-desirable neighborhoods than they might like. The decision between buying and renting is a financial trade-off between saving more each month on a mortgage payment versus spending more on rent but taking advantage of the location and lifestyle amenities urban renting often offers." Despite the matched monthly costs of renting and homeownership, many renters still won't be able to afford to buy a home— and that's due to down payments. "Rent is more expensive than ever before," Zillow reported. "Affordability is a growing concern across the country, and rent requires almost half of the median income in some of the nation's most expensive markets. A mortgage payment is cheaper than a rental payment on a monthly basis, but saving enough money for the down payment is holding back many renters from crossing over into homeownership." At the local level, 37 out of the 50 markets Zillow analyzed showed renters could buy a property more than the city's median value without paying more in monthly expenses. In Cleveland and Milwaukee, renters can ac - tually purchase a home more than two times the cost of a median-priced one. "In Cleveland, prospective buyers can buy a home valued at $174,194 while keep - ing all monthly housing costs the same—this represents more than 80 percent of homes currently on the market," Zillow reported. Of the few exceptions, San Francisco had the biggest discrepancy between renter and homebuyer monthly costs. "Renters in San Francisco who want to keep monthly expenses the same would have to buy a home valued at $865,857, represent - ing just 23 percent of homes currently on the market. The median home value in the city of San Francisco is over $1 million." Fortunately, rents are slowing down in parts of the country, and this could help make homebuying even more affordable for some markets. "Recent slowdowns in rent growth may take some of the edge off for renters saving to become homeowners," Gudell said. 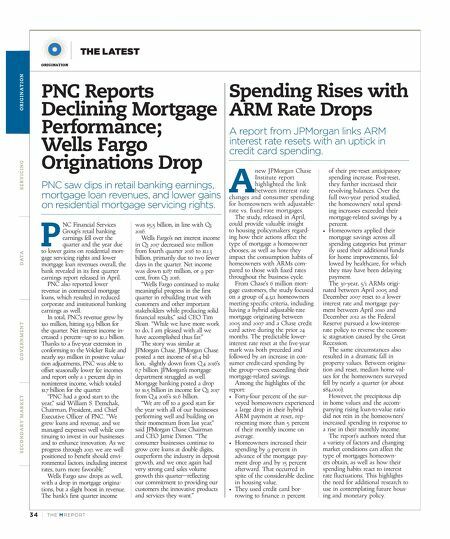 "This is good news, since saving a down pay - ment, qualifying for a loan, and finding a home available at a manageable price remain hurdles for millions of aspiring buyers."